The Bellagio Las Vegas wasted no time in becoming a hot property with visitors from around the globe when it opened in 1998. 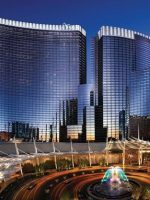 Located directly on the famous Las Vegas Strip, the hotel features 3,933 guestrooms, more than 100,000 square feet of gaming, five outdoor pools, a spa and salon, high-end shopping, 20 dining options, art galleries, nightclubs, a fitness center, and an onsite Cirque du Soleil show. 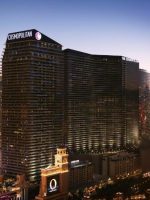 In 2012, the property completed a $70-million remodel of 2,568 deluxe guestrooms in the main tower, followed by a $40-million remodel of all 928 guestrooms and suites in the Spa Tower, which was completed in January 2013. However, the hotel is most recognized for the dancing water fountains located in front of it. More than 1,200 fountains dance to choreographed music and lights throughout the day and night, with some reaching as high as 460 feet in the air. Visitors of all ages are captivated when the music starts and the water rises. A close second, the hotel’s conservatory and botanical gardens also draw a large crowd each day. Arranged in a theatrical presentation that changes five times a year, the display encompasses more than 13,500 square feet. Every day, guests can speak with the Bellagio horticulturists for gardening tips. There’s so much to do at the hotel, guests may find it difficult to explore every area before they check out. With 3,933 guestrooms that include 512 suites, there are many choices for families when it comes to selecting accommodations. Regardless of which you choose, all guestrooms share similar features and amenities. These include a 40-inch, flat-screen HDTV with an integrated entertainment center, ergonomic desk/workstation, mini-bar, media hubs, bedside iHome docking station, nightstand safe, automatic drapery and sheer controls, an exclusive Bellagio Cashmere Super Pillow Top mattress with Advanced Comfort Quilt by Serta, Italian marble bath with soaking tub and glass-enclosed shower, and robes. Wi-Fi is available in-room for a fee. There is a small number of DVD players available, but these incur an additional charge. Likewise, an in-room microwave can be provided with an additional charge. In-room refrigerators are only provided to guests with babies or upon medical request. Rollaway beds also are available for an additional fee; in addition, only one extra bed is permitted per room. 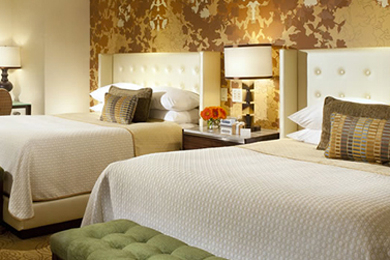 Bellagio offers five types of guestrooms, along with 10 different types of suites and a collection of nine villas. Except for the Resort Tower King, all regular guestrooms are 510 square feet. The Resort Room King contains a king bed, while the Resort Queen Room comes with two queen beds. The Fountain View, Deluxe Fountain View, and Premier Fountain View all contain either a king bed or two queen beds, while the Resort Tower King also contains a king bed, but the room is larger, with 626 square feet. The hotel also includes 63 accessible rooms with roll-in showers, shower chairs and lavatory rails. Upon request, the hearing impaired can receive hospitality kits, and wheelchairs are available through the bell desk. Suites include the Salone Suite, Bellagio Suite, Cypress Suite, Tower Suite, Penthouse Suite, Executive Suite, Executive Parlor Suite, Grand Lakeview Suite, Presidential Suite and Chairman Suite. Each suite ranges in size from 853 square feet for the Salone Suite to the Presidential and Chairman Suites, each of which measure 4,075 square feet in size. The Salone Suite, Bellagio Suite, Cypress Suite, Tower Suite, Executive Suite and Executive Parlor Suite each have one bedroom, while the Penthouse Suite is available with one or two bedrooms. The Grand Lakeview Suite, Presidential Suite and Chairman Suite each have two bedrooms. 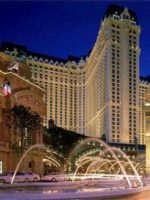 For truly private accommodations, the Bellagio offers nine villas, with the choice between 6,500-square-foot, two-bedroom, five-bathroom villas, and 8,000-square-foot, three-bedroom, seven-bathroom villas. Each villa also comes with a private kitchen, a formal dining room, a full bar stocked with guests' favorite beverages, a dual fireplace, a private terrace and garden with a pool and whirlpool, an in-suite workout facility, a dry sauna, a massage room and a private hair salon. The location is great and the rooms are beautiful but this hotel is expensive. A $39 resort fee and then a tax on the resort fee. I would rather stay somewhere else and visit the Bellagio. The flowers are unbelievable! Our overall experience was enjoyable and memorable. The rooms are fabulous and the staff and security are wonderful. The downside for us was the $ for a cup of coffee and the crowds. Bellagio is the place to be on the strip so it gets quite busy in the afternoons and evenings. We really enjoyed watching the fountain from our room. Definitely the best free show on the strip. It was always exciting to watch! Bellagio's world-famous Fountains of Bellagio will capture the imagination of all visitors, young and old. Watch as more than 1,200 fountains across a lake of more than 8.5 acres dance and swirl to music and lights. The fountains perform daily every 30 minutes, with performances every 15 minutes from 7 p.m. to midnight. Catch the show from along the Bellagio's front sidewalk, or watch from your fountain view room as the soundtrack plays on your TV. Covering more than 13,500 square feet, the Conservatory and Botanical Gardens put on a breathtaking display of flora throughout the year. Changed seasonally with a special exhibit to celebrate the Chinese New Year, the Conservatory and Botanical Gardens welcomes visitors to stroll through and peruse the variety of plants, flowers and trees crafted into exquisite formations. During the hours of 10:30 and 11:30 a.m., guests are invited to speak with Mr. and Mrs. Green Thumb, who welcome questions about the gardens. Also, from 5 to 6 p.m., visitors can enjoy live music in the South Garden. 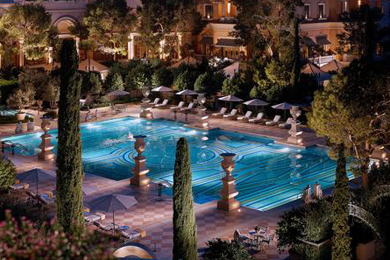 Bellagio features five pools, each in Mediterranean courtyard settings. All pools are open to families, and there are lifeguards on duty. The pool hours depend on the season; however, all pools are open throughout the year. There also are four whirlpools and 51 private cabanas. All children under 14 must be accompanied by a parent or guardian who is at least 18 years of age. Enjoy an evening of romance and beauty at a "O" by Cirque du Soleil. Audience members will be caught up in a world that transcends water and air. Guests under 5 years are not permitted into the "O" Theatre, and those between the ages of 5 and 17 must be accompanied by an adult. Discover some of the world's finest art without ever leaving the hotel at the Bellagio Gallery of Fine Art. With a stated goal of providing a cultural destination for visitors of all backgrounds and interests, this museum-caliber gallery features exhibits carefully selected from prestigious international collections. The gallery is open daily from 10 a.m. to 8 p.m., with the last admission sold 30 minutes prior to closing. Tickets are $16 for general admission, and $13 for Nevada residents and seniors ages65 and older. Tickets are $11 for students, teachers and military with valid I.D. Children 12 and younger are free. Admission includes an audio wand and docent tour. Docent tours are available daily at 2 p.m., but are limited to the first 25 attendees. The Bellagio features 20 different dining options. They range from high-end fine dining to the casual pool cafÃ©. Although all restaurants (except Jean Philippe PÃ¢tisserie) have high chairs available, none of the restaurants offer kids' menus or coloring sheets with crayons. This 24-hour restaurant serves breakfast, lunch and dinner with a focus on American cuisine. Breakfast items range from omelets and waffles to corned beef hash and oatmeal. For lunch and dinner, selections include appetizers like French onion soup and tiger shrimp cocktail, salads such as the Applewood Cobb Salad and Greek Salad, as well as burgers, sandwiches and pasta. Seafood, steaks and chicken also are available. Serving breakfast, lunch and dinner, plus brunch on the weekends, The Buffet offers up a wide variety of dishes cooked in a variety of styles, including Italian, Japanese, Chinese and American. Open spring through fall, the Pool CafÃ© offers breakfast and lunch. Breakfast selections include fruits and cereals, fresh-baked breads, and entrees, such as steak and eggs and ham and cheese omelets. For lunch, try appetizers like grilled fish tacos or sushi rolls and salads, such as summer crab salad or Asian chicken salad. There also are a number of burgers and sandwiches, each served with fries, potato chips or coleslaw. For a taste of the Far East, enjoy lunch or dinner at Noodles. Start with dim sum, such as pot stickers or crispy shrimp balls, or choose an appetizer like edamame or oxtail soup. Another starter option is one of the many soups, including wonton noodle or spicy Thai shrimp noodle. EntrÃ©e choices are plentiful, with Kung Pao chicken, Pad Thai and crabmeat fried rice among them. Another lunch or dinner option, Olives dishes up Mediterranean-style cuisine. Lunch starters include oysters on the half shell and watermelon salad, or choose from a number of flatbreads like Portobello or fig and prosciutto. Pastas range from ricotta ravioli to sweet pea mezzaluna, while entrÃ©e choices include jumbo prawns and steak frittes. At dinner, satisfy your appetite with Atlantic salmon and beef tenderloin, as well as many of the same starters and pastas offered at lunch. Described as upscale Tuscan, this restaurant offers a dinner menu consisting of pizzas, pasta, seafood, beef and chicken, among others. The dress code is business casual. Boasting a menu filled with Italian, Asian and American specialties, Sensi serves up small plates, such as poutine and sashimi, appetizers like kale salad and Anson Mills grits, and entrees including diver scallops and filet mignon. Open only for dinner, FIX features classic American fare that includes small plates, soup, salads, steaks, chicken, seafood and pork. Selections range from lobster tacos and roasted tomato soup to Bobby Baldwin Burgers and pork prime rib. If you want a more upscale dinner, try this Japanese restaurant, which serves up shared plates of vegetable tempura or tuna tataki. Specialty rolls range from popping spicy crab to rock shrimp hand roll, or you can go with traditional favorites like the California roll or salmon skin roll. Sushi and sashimi also are available. At Prime, you'll experience fine dining for dinner at a traditional steakhouse. Steaks, seafood and chicken headline the menu, which is supplemented with a choice of appetizers, soups, salads and sides. For the best in seafood, head to MICHAEL MINA for dinner in a fine dining environment. Supplement entrees like Chilean sea bass or Maine lobster pot pie with starters such as sweet onion soup or artichoke salad. Also open for dinner, Jasmine features a menu full of Chinese favorites, including vegetable spring rolls, imperial hot and sour soup, Dungeness crab, wok-fried plank steak, and lemon chicken, along with a variety of vegetables, noodles and rice. On Sundays, come to Jasmine for the Fountains Brunch, which features a number of dishes cooked up at the many cooking stations. 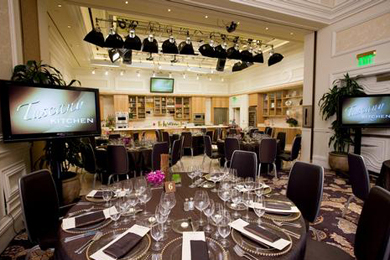 One of the Bellagio's two AAA, Five Diamond restaurants, Le Cirque specializes in French cuisine. With a number of menus available, it could be hard to make a choice, especially when selections include butter poached Maine lobster, roasted veal breast and sweetbreads, and whole roasted Muscovy duck. 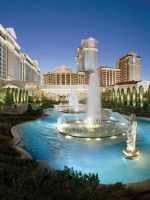 The Bellagio's second AAA, Five Diamond restaurant, Picasso touts a seasonal menu of French cuisine with Spanish influences. Because the menus are seasonal, choices change periodically, but have included sautÃ©ed filet of New Zealand tai snapper, Japanese Wagyu filet mignon and roasted tournedo loin of Colorado lamb. For a bite of something sweet, head to this decadent shop, which is filled with a mouthwatering selection of chocolates, cookies, cakes and crepes. You also will find sandwiches and salads. For quick bites, such as soups, sandwiches, pastries, pastries and ice cream, pop into CafÃ© Gelato, Palio, Palio Pronto and Snacks. Guests can arrange for a number of welcome amenities from the hotel. Order a treat from Room Service Amenities Menu. Options include fruit bowls, chocolates, cheese plates and champagne. Special birthday treats are available as well. Babysitting services are not available directly through the hotel; however, the concierge has an outside service that guests can utilize. 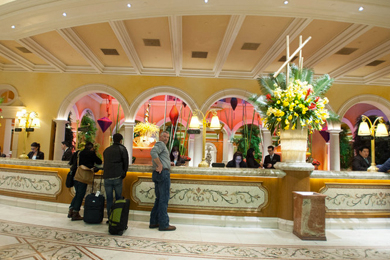 Upon check-in, guests are charged a daily resort fee of $28. Bellagio remains in high demand year-round, but it's especially tough to get a reservation during January and February. November and December are traditionally low season for the hotel, so this is the best time to find reasonable rates. The hotel also offers discounts to AARP members, AAA members and members of the military, year-round. Las Vegas usually experiences a mild winter, so high temperatures during January and February are normally in the 50's to 60's. During November and December, high temperatures generally are in the 60's. During warmer months, expect these average high temperatures to increase, with the summer months experiencing very hot conditions. 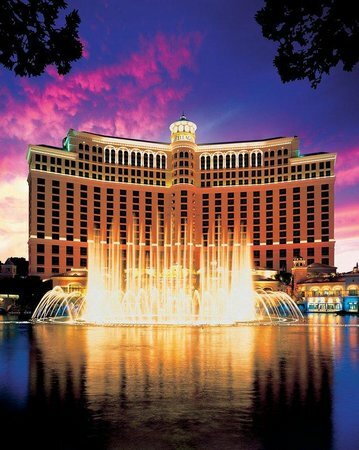 The Bellagio is a 10-minute cab ride from McCarran International Airport (LAS). Although the hotel does not offer shuttle service, visitors can obtain shuttle rides through outside companies. If opting for a taxi ride, expect to pay between $15 and $20 for the 10-minute ride. Rent a car if planning to travel around Las Vegas -- major car rental companies are available at the airport. Although the hotel does not provide shuttle service, there are cab buses that take visitors around the city for a fee. The concierge can provide information on the bus company, stops and pricing. 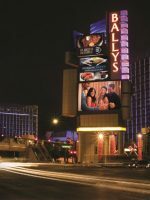 Many sights along the Strip are within walking distance of the hotel. If you have a car, self-parking at the hotel is free. When mom and dad are able to carve out a few hours of alone time, they should head to Spa Bellagio for a couples massage. Afterward, they can enjoy a quiet, intimate dinner at Picasso. Wrap the evening up with a cocktail at Hyde Bellagio, one of the hotel's nightclubs, or try your luck at the casino. Overlooking the Fountains of Bellagio, this indoor/outdoor venue is the perfect place to focus on each other for an hour or two.